Conducting is the communication of musical intention to performers through gesture. In The Craft of Conducting Denise helps the student to acquire a technique which can be learned by anyone, regardless of gender or physique. "An outstanding guide to conducting technique. These clear and comprehensive DVDs will be invaluable to anyone who is serious about acquiring the craft. There is no doubt that Denise Ham is one of the very finest teachers of conducting in Europe. Her teaching of technique is exemplary in every respect. What distinguishes her approach to technique is that she never allows her pupils to forget what it is for...the MUSIC! " "It is something of a rarity to hear of an instructional video for conductors... Every issue Ham covers is filmed clearly, often from multiple angles, and she demonstrates a number of exercises that might be used to help with specific areas... Denise Ham covers most of what is possible...and does so with care and precision"
"It was my intention just to dip into this DVD but it was so compelling that I found myself watching the whole thing. 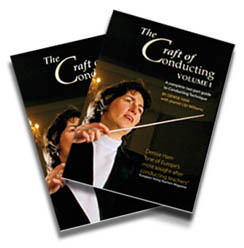 "The Craft of Conducting" is exactly that - a wealth of information clearly communicated, which will be invaluable to all who currently conduct or whose ambition is to guide and inspire those in orchestras, bands and choirs."